C. elegans body wall muscle provides animals with the ability to move in sinusoidal waves while lying on their left or right side (see Somatic Muscle). Bodywall muscles are positioned in four quadrants arranged longitudinally along the body’s anterior-posterior axis (DMusFIG 1 & DMusFIG 2; see also MusFIG 10). The two dorsal quadrants are innervated jointly from the dorsal nerve, and the two ventral quadrants from the ventral nerve. This arrangement allows contractions of the dorsal quadrant muscles to be matched with simultaneous relaxations of the ventral quadrant muscles, and vice versa, resulting in smoothly coordinated body movement as waves of muscle contraction proceeding along the length of the body. In the dauer, muscle occupies a relatively larger volume fraction of the bodywall because other tissues are profoundly shrunken. The relative shrinkage of the hypodermis also allows the muscles to occupy a much larger fraction of the outer surface of the bodywall, where they appose to the cuticle. DMusFIG 1: Head muscles in L2, dauer and L4 larvae. Upper panel, arrow shows approximate position of EM slices in the head near the nerve ring. A-C. Transverse EM sections showing head muscles (green). A. L2. (Image source: [D. Riddle] L2 28-14 1057.) B. Dauer. (Image source: [D. Hall] N974 032.) C. L4. (Image source: [N. Thomson] JSH 108.) Dauer muscles show shrunken muscle belly (cytoplasm), but retain intact sarcomeres in a row near the cuticle. N, nucleus. Bars, 1 μm. In the dauer stage, body wall muscles retain well-ordered sarcomeres, which comprise the contractile myofilament apparatus (see MusFIG 9). Compared to the L2 stage, dauer sarcomeres develop into larger structures, with twice as many myosin filaments in the lattice when measuring their depth from the cuticle, and 50% more myosin filaments when measuring side to side from the M-line (DMusFIG 3). The dense body structures linking the myofilaments to the cuticle remain well ordered in dauer muscle and are also larger in proportion to the sarcomere depth. Judging by the increased size of the myofilament lattice, the strength of muscle contraction in the dauer is probably increased by 200% or more compared to the L2 animal, enabling the dauer to respond to stimuli with more powerful motion. 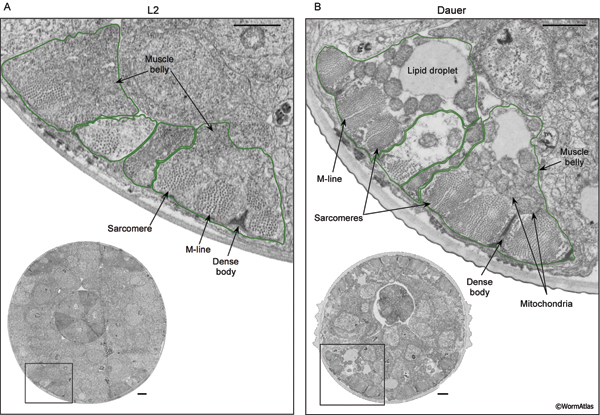 Although dauer sarcomeres appear enlarged and are functional, the “muscle belly” cytoplasm of dauer muscle is moderately shrunken and filled with relatively large, electron dense mitochondria. Popham and Webster (1979) reported that dauer muscle mitochondria exist in the condensed conformation, which is associated with rate-limited levels of oxidative phosphorylation substrates and reduced respiratory rates (Hackenbrock et al., 1971). Enlarged mitochondria may supply large amounts of energy on a short-term basis to the dauer body muscles as compared to the capabilities of body muscles in L2 larvae. While the volume fraction of mitochondria in the dauer muscle belly is increased, other cytoplasmic components are reduced (DMusFIG 3). In reproductive animals, the muscle cytoplasm is filled with a granular substance, also known as “ground substance”, representing ribosomal complexes and/or RER as well as other soluble proteins (DMusFIG 3A). In contrast, the dauer cytoplasm appears emptier and less complex, lacking the granular substance in many cases (DMusFIG 3B). Lipid droplets and glycogen storage deposits are also observed more frequently in dauer muscle cells (DMusFIG 4, Popham and Webster, 1979). 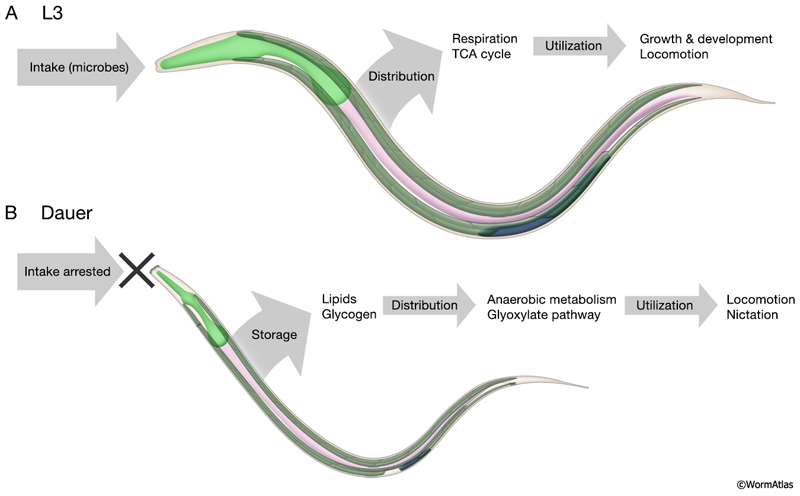 Muscles are major glycogen reservoirs in nematodes at all stages, and glycogen may be an important energy source for dauers. Metabolism is slowed in the dauer stage, as evidenced by reduced oxygen consumption and ATP levels (Wadsworth and Riddle, 1988; Vanfleteren and DeVreese, 1996; Houthoofd et al., 2002). In addition, cellular processes are shifted toward energy conservation. For example, the rough ER cisternae and Golgi saccules are smaller in dauers than non-dauers (Popham and Webster, 1979). These metabolic changes allow non-feeding dauers to survive for long periods, relying instead on stockpiles of stored lipids for energy. Dauer metabolism is specialized for usage of stored lipids, due to relatively reduced activity of the TCA cycle with concomitantly increased glyoxylate cycle (DMusFIG 5; O'Riordan and Burnell, 1990; Wang and Kim, 2003). Fats are stored in the dauer intestine and epidermis (Ogg et al., 1997), converted into glycogen and trehalose and transported to muscles (McElwee et al., 2006). Dauers may also synthesize ATP through anaerobic pathways, such as malate dismutation and ethanol fermentation (Braeckman et al., 2009). DMusFIG 5: Metabolic differences in L3 and dauer larvae. A. In developing larvae, such as the L3, nutritional intake is distributed from the intestine to target tissues, including muscles (green) and the developing germline (blue). Metabolic resources are utilized through the TCA cycle for growth, development and movement behaviors. B. 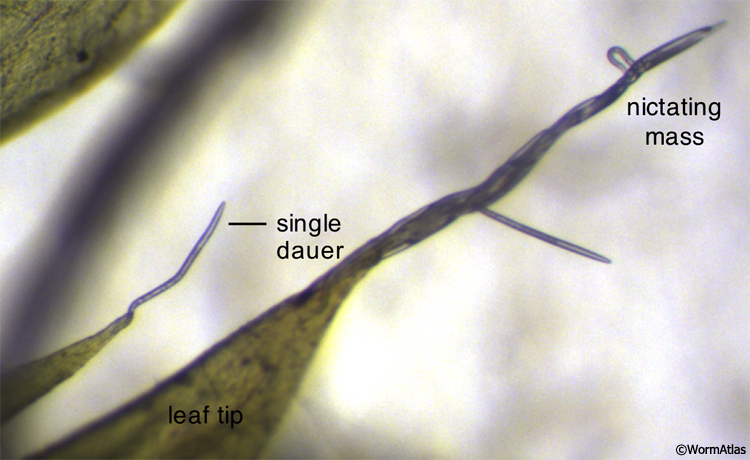 In dauer larvae, nutritional intake is interrupted by the thick dauer cuticle. During dauer formation, metabolic resources are stored as lipids and glycogen in the intestine and hypodermis. In dauer larvae, these resources are utilized, in part through anaerobic pathways, for locomotion and nictation. Movement behaviors are altered in dauers. While adults and developing larvae actively explore their environment in search of food, dauers tend to lie motionless until physically stimulated (Gems et al., 1998; Gaglia and Kenyon, 2009). This distinctive behavior may help dauers conserve energy. Upon sensing a stimulus, dauers are able to move quite rapidly, somewhat faster than adults. This rapid response to stimuli indicates that the neuromuscular capacity for movement remains intact in dauers, and may even be considered hyper-reactive. Dauer muscles are highly sensitized to neuronal stimuli. The C. elegans neuromuscular junction is formed by membranous projections, called muscle arms, reaching from the body muscle cytoplasm to the dorsal and ventral nerve cords (see Nervous System: Motor neurons and the motor circuit). In dauers, muscle cells extend greater numbers of these muscle arms to enhance neuromuscular connectivity (Dixon et al., 2008). In addition, dauer muscle demonstrates greater sensitivity to the neurotransmitters that activate muscle movement in C. elegans (Lewis et al., 1987). Efficient and rapid locomotion may help dauers escape from threats and also to target vectors for dispersal to new environments (See Dauer Nervous System: Behavior). Nictation behavior is specific to the dauer, allowing the animal to wave its body upwards in the air while attached by the tail to a substrate (Cassada and Russell, 1975) (DMusFIG 6; see also Dauer Nervous System Behavior and DBehaviorVID 1 and VID 2). Little is known about the state of muscle contraction during the behavior. Nictation posture may depend on hypercontraction of all muscles and may also be dependent on the rigid dauer cuticle to hold the body straight. Body wall muscle coordination must be altered during the behavior, as the body is held straight with slow, non-propagating body bends. DMusFIG 6: Dauers performing nictation behavior. C. elegans dauers performing nictation behavior in the wild from the tips of pointed moss leaf tips. In the lower-left of the field, a single dauer is nictating alone. A large mass of dauers nictating together is shown in the center and right regions of the field. (Image source: Marie-Anne Félix, Institute of Biology of École Normale Supérieure.) See also DBehaviorVID 1 and VID 2. Edited for the web by Laura A. Herndon. Last revision: November 18, 2013.